As the book opens, we meet Chicago Police Lieutenant Robert Fury who is preparing to take some vacation time coinciding with the upcoming birth of his first child. His pregnant wife is the former Mary Ellen Quinn, daughter of a famous wealthy businessman in Chicago. Meanwhile, a heist crew has an elaborate plan to knock over a large department store at opening time on payday when the armored truck arrives with the cash. The crew is filled with basic malevolent thugs plus a hot babe getaway driver who gets super-horny when whipped with a belt. So, there’s that. A confluence of events involving a Chicago crime lord, rogue cops, and pregnant Mary Ellen being at the wrong place at the wrong time conspire to turn the heist into a total bloodbath. One thing leads to another and Mary Ellen - the very pregnant wife of Chicago Police Lieutenant Fury - is snatched away by one of the robbers and taken as a hostage. The action shifts nicely from character to character with the core being Mary Ellen with the heist crew while Lt. Fury tries to find his missing bride before she goes into labor. The Chicago Police are also hot-to-trot to catch the bad guys, which makes for a nice police procedural aspect to the story. This is exciting stuff, and Ozaki keeps the story moving with short scenes that cut from one third-person POV to another - a literary technique effectively employed by Stephen King years later. I was left with the impression that Ozaki was a way better writer than most of his contemporaries, yet oddly he’s never remembered for the quality of his plotting. I’ve heard that his stand-alone crime novels are superior to his series books, and this paperback supports that theory nicely. 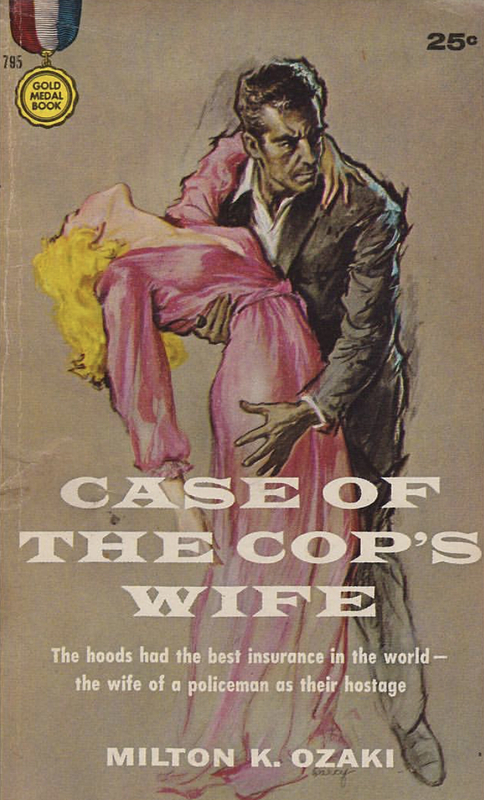 If “Case of the Cop’s Wife” is a fair representation of Ozaki’s talent as an author, he really was something special. In any case, this is a terrific novel that crime-suspense-heist-police procedural fans are sure to love. It’s certainly one of the most compelling books I’ve read this year. Highly recommended.